Zoology: The Roundtables � Ginnifer Goodwin hosts an in-depth look at the movie�s characters, animation, environments and more. The artists at Disney Animation give a rare and in-depth look at the complexities of bringing an all-animal world to life from the ground-breaking technology behind the characters� fur and clothing to the varied and vast environments of Tundratown, Sahara Square and the Rainforest District as well as the deep thought and research given to bringing 64 unique animal species to life through animation. The Origin of an Animal Tale � Follow the story�s development from its origins to a big story shift that turned the film upside down. 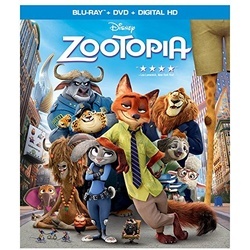 In this feature-length documentary, filmmakers give a candid look into the difficulties of creating the story of Zootopia and the bold decision to switch the main character late in the production process, putting one resolute rabbit center stage. Research: A True-Life Adventure � The filmmakers traveled the globe to find inspiration for the diverse characters and amazing city of Zootopia. They reflect on the importance of research and how a deep dive into animal behavior at Disney Animal Kingdom theme park and a deep immersion into animal society on the African savanna shaped and inspired the characters of Zootopia and changed the filmmakers� lives forever. Z.P.D. Forensic Files � Find the movie�s hidden Easter Eggs. Every city has its hidden gems, especially when it has been created by the filmmakers of Disney Animation who love nothing more than sprinkling hidden references to some of Disney�s greatest animated features throughout the story. Scoretopia � Academy Award-winning composer, Michael Giacchino spotlights five of cinema�s greatest percussionists and how they brought an organic, animalistic sound to his powerful and emotional music score. Deleted Characters � Directors Byron Howard and Rich Moore introduce citizens of Zootopia who did not make the final cut.